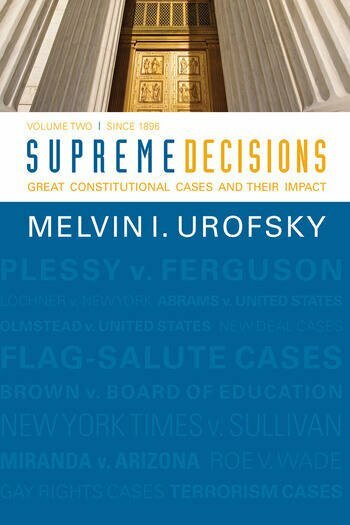 Supreme Decisions: Great Constitutional Cases and Their Impact, covers twenty-four Supreme Court cases (twelve per volume) that have shaped American constitutional law. Interpretive chapters shed light on the nuances of each case, the individuals involved, and the social, political, and cultural context at that particular moment in history. Discussing cases from nearly every decade in a two-hundred-year span, Melvin I. Urofsky expounds on the political climate of the United States from the country's infancy through the new millennium. Featuring Marbury v. Madison, Dred Scott v. Sandford, Miranda v. Arizona, Brown v. Board of Education, and many more, this text covers foundational rulings and more recent decisions. Written with students in mind, Melvin I. Urofsky's voice offers compelling and fascinating accounts of American legal milestones.